After wrapping up a four-year collegiate career at Bowling Green State University, defenseman Adam Smith was ready to turn pro. While the Nashville Predators were not prepared to offer the 2016 seventh-round pick an entry-level contract, the invisible hand of the market still guided Smith to the organization. The Predators’ AHL affiliate, the Milwaukee Admirals, announced a two-year AHL deal with Smith today. The contract will begin with 2019-20, as Smith finishes out this season on an amateur tryout offer. Smith, 22, is not much of an offensive asset on the blue line, but played an important role for Bowling Green en route to an NCAA Tournament appearance as a dependable defensive presence. If he continues to progress over a couple years in the minors, Smith could find himself with an NHL deal with Nashville down the road. Former Big Ten rivals Jack Sadek and Nick Boka have become teammates at the pro level this last month after the duo signed amateur tryouts with the AHL’s Iowa Wild. The defense pair are both recent draft picks of the Minnesota Wild – Boka in the sixth round out of the University of Michigan and Sadek in the seventh round out of the University of Minnesota, both in 2015 – but did not do quite enough in their college tenures to earn entry-level contracts right away. Instead, they were asked to show that they were worthy of a continued investment by the Wild, starting with a stint with the ECHL’s Allen Americans. Now, both players have been recalled by Iowa as the first step toward getting closer to an NHL deal. Both Sadek and Boka are right-handed shots with good size who improved over their four years in college, so there is a lot to like about the prospects. However, they both have work to do to earn an extended look with the organization. The AHL may have another “true rookie” to look forward to next season. USHL standout Egor Afanasyev, who many see as a fringe first-round pick in the upcoming NHL Draft, appears destined to follow in the footsteps of fellow imports like Klim Kostin and Martin Kaut by jumping right to the pro level next year. Afanasyev de-committed from Michigan State University earlier this year and has not been looking to join another college program next season. Meanwhile, he was drafted into the OHL by the Ottawa 67’s and had his rights traded to the Windsor Spitfires this season, but there has been little to no talk of him joining the junior squad. Instead, the Russian-born power forward clearly prefers to play in the AHL next season. He does have the size to do so; Afansyev stands 6’3″ and over 200 lbs. and plays with an edge to match. He also has the skill, as he has scored at better than a point-per-game clip this season for the Muskegon Lumberjacks and the deeper analytics indicate he has been even better than that. Ultimately, the team that drafts Afanasyev will decide on what the best next step would be in his development, but as his draft stock continues to rise it is becoming increasingly likely that he makes his pro debut in 2019-20. In the NHL, first-round draft picks hold especially high expectations. Selections made in rounds two through seven hold reasonably similar career expectations, meaning that teams are just hoping to find a few hidden gems on the second day of the draft. Those taken in the top 31 though bring real excitement and scrutiny, even just a few months after they join the organization. Many players will not make the NHL the year following their draft. Some won’t even sign contracts right away, instead taking their talents to the collegiate ranks where they must maintain their amateur status. The NCAA has become more and more competitive through the decades, and is now considered a top development league for some of the most talented players in the world. Delaying your first contract to play in college is almost never a real detriment to a career, and often results in a more well-rounded game when joining the professional ranks. Some too will return to junior or their respective international league to continue their development. These decisions can come with or without a corresponding professional contract, and can even be made well into the NHL season. Some organizations believe in giving their top prospects a taste of NHL life before sending them back to dominate the junior ranks, allowing them to build up the desire to return to the best league in the world as soon as possible. Rasmus Dahlin (BUF) – Signed ELC on July 9. Will play in NHL for 2018-19. Andrei Svechnikov (CAR) – Signed ELC on June 30. Will play in NHL for 2018-19. Jesperi Kotkaniemi (MTL) – Signed ELC on July 1. Will compete for NHL spot, expected to play in Finland for 2018-19. Brady Tkachuk (OTT) – Signed ELC on August 13. Will compete for NHL spot, could play in Belleville (AHL) or London (OHL) for 2018-19. Barrett Hayton (ARZ) – Signed ELC on July 6. Expected to play in Sault Ste. Marie (OHL) for 2018-19. Filip Zadina (DET) – Signed ELC on July 7. Will compete for NHL spot, expected to play in Grand Rapids (AHL) for 2018-19. 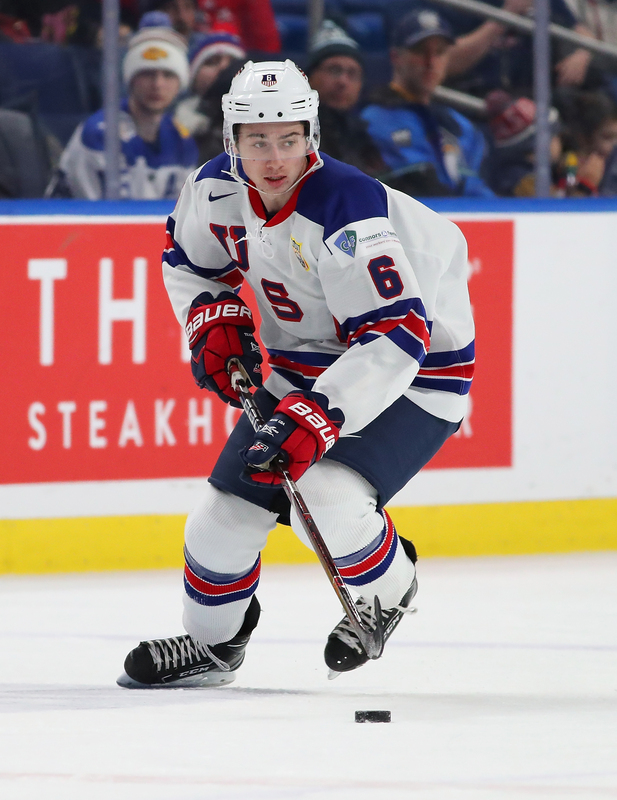 Quinn Hughes (VAN) – Unsigned. Will play at University of Michigan (NCAA) for 2018-19. Adam Boqvist (CHI) – Signed ELC on July 1. Expected to play in London (OHL) for 2018-19. Vitali Kravtsov (NYR) – Unsigned. Will play in Chelyabinsk (KHL) for 2018-19. Evan Bouchard (EDM) – Signed ELC on July 17. Will compete for NHL spot, expected to play in London (OHL) for 2018-19. Oliver Wahlstrom (NYI) – Unsigned. Will play at Boston College (NCAA) for 2018-19. Noah Dobson (NYI) – Signed ELC on August 13. Will compete for NHL spot, expected to play in Acadie-Bathurst (QMJHL) for 2018-19. Ty Dellandrea (DAL) – Unsigned. Expected to play in Flint (OHL) for 2018-19. Joel Farabee (PHI) – Unsigned. Will play at Boston University (NCAA) for 2018-19. Grigori Denisenko (FLA) – Unsigned. Will play in Yaroslavl (KHL) for 2018-19. Martin Kaut (COL) – Signed ELC on July 5. Will compete for NHL spot, expected to play in Colorado (AHL) for 2018-19. Ty Smith (NJD) – Signed ELC on August 20. Will compete for NHL spot, expected to play in Spokane (WHL) for 2018-19. 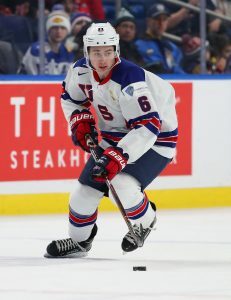 Liam Foudy (CBJ) – Signed ELC on July 30. Expected to play in London (OHL) for 2018-19. Jay O’Brien (PHI) – Unsigned. Will play at Providence College (NCAA) for 2018-19. Rasmus Kupari (LAK) – Signed ELC on July 13. Will play in Finland for 2018-19. Ryan Merkley (SJS) – Signed ELC on July 18. Expected to play in Guelph (OHL) for 2018-19. K’Andre Miller (NYR) – Unsigned. Will play at University of Wisconsin (NCAA) for 2018-19. Isac Lundestrom (ANA) – Signed ELC on August 7. Expected to play in Sweden for 2018-19. Filip Johansson (MIN) – Unsigned. Expected to play in Sweden for 2018-19. Dominik Bokk (STL) – Signed ELC on July 11. Expected to play in Sweden for 2018-19. Jacob Bernard-Docker (OTT) – Unsigned. Will play at University of North Dakota (NCAA) for 2018-19. Nicolas Beaudin (CHI) – Unsigned. Expected to play in Drummondville (QMJHL) for 2018-19. Nils Lundkvist (NYR) – Unsigned. Expected to play in Sweden for 2018-19. Rasmus Sandin (TOR) – Signed ELC on July 16. Expected to play in Toronto (AHL) or Sweden for 2018-19. Joe Veleno (DET) – Unsigned. Expected to play in Drummondville (QMJHL) for 2018-19. Alexander Alexeyev (WSH) – Unsigned. Expected to play in Red Deer (WHL) for 2018-19. Martin plays a complete, two-way game. He competes, he’s strong on the puck. He’s got a great shot, and he’s a pure goal scorer. We just like the upside and what he can bring to our club. Kaut was a dominant player for the Czech World Junior team a few months ago, part of an excellent forward group that also included Filip Zadina and Martin Necas. He also recorded 16 points in 38 games at the highest level in his home country, an impressive feat for a player who won’t turn 19 until October. Unfortunately he was limited during the recent NHL Scouting Combine due to a heart issue that was found during his medical exam, keeping him from doing any of the physical testing. Still, since the issue wasn’t a major problem the Avalanche quickly snapped him up when he was available at 16. The talented winger should fit in nicely with a young prospect group coming through the Colorado system. Cale Makar, Conor Timmins, Josh Dickinson and others are already closing in on making an impact at the NHL level, while Nathan MacKinnon leads a group of early-20 players already among the best in the league. That doesn’t even touch on the fact that they should get another high pick when Ottawa surrenders their 2019 first-round selection thanks to the Matt Duchene trade from last year. Colorado looks like they’re ready for sustained success, and Kaut is only another piece to that puzzle. While the 2018 Scouting Combine has evolved over the years, much of the combine is nothing more than cardio and fitness events to pick apart the differences between prospects. While there is plenty more than that, change could be coming in the future as Ryan Kennedy of The Hockey News writes that on-ice drills could be coming soon. The scribe writes that he spoke to one executive who believes that on-ice testing will be required, especially if the league intends to televise the combine in the future. The main reason there are no on-ice drills is because some players haven’t been on the ice in months, while others have only recently finished their playoff runs. Another testing issue that has come up that recently is the constant improvement of technology as times are so much more accurate that you can no longer compare times to older times of five and 10 years ago when they used stopwatches compared to laser times. Another problem is that the combine keeps changing its events. The bench press is no longer about reps and more about power output, while the Wingate bike test made changes in its times as well to simulate real NHL shifts. While the changes are good, teams now can’t compare how a prospect did compared to even players from a couple of years ago. For a look at the top-10 performers for each drill, go here. Kennedy also reports that prospect Martin Kaut left the combine early after a physical detected a heart problem that was swiftly dealt with. The 18-year-old Czech winger, who was considered to be a mid to late first round pick, won’t see his stock drop. According to Kennedy, everyone he talked to said that it shouldn’t affect his draft stock. NHL.com’s Mike Morreale writes that defensemen combine prospects Evan Bouchard and Noah Dobson each had solid fitness tests Saturday. The top two right-handed defensemen in the 2018 NHL draft are expected to be taken in the top 10. Bouchard, who led all defensemen in the OHL with 87 points this year, excelled in upper-body exercises, including a second place finish with 14 pullups and 16th in the bench press after generating a 6.73 watts of power. Dobson, who was an all-star in the QMJHL with 69 points, reached 20 inches in the vertical jump and 110.3 inches in the standing long jump event, both good scores. The Athletic’s Scott Wheeler reports that OHL prospect Ryan Merkley, one of the top offensive defensemen in the draft, has seen his stock drop due to issues with both his defense and character concerns, met with 25 teams at the combine and was repeatedly asked about his attitude. Merkley supposedly admitted he needs to work on both his defense and body language. He hopes to be taken anywhere from 10-31 in the first round. The 2018 NHL Entry Draft is fast approaching on June 22nd, and the league has released the list of 104 players invited to this year’s scouting combine. The group includes top prospects like Rasmus Dahlin, Andrei Svechnikov and Filip Zadina, along with many others who are just hoping to hear their name called at some point in a few weeks. Starting today, teams are able to meet this week with potential draft picks for 1-on-1 interviews to better determine the kind of person they are. Though obviously these discussions likely won’t change the first-overall selection, they could bring a player further onto a team’s radar for later in the draft. It’s a chance to impress with your dedication and drive, before getting the opportunity to show them your physical attributes next weekend. The fitness testing will commence on Saturday, with potential top pick Rasmus Dahlin getting involved early (currently scheduled for 8:30am CT). Below is a full list of the attending players, but for more detailed information check out Scott Wheeler of the Athletic’s Twitter image. The last few years almost every professional hockey league and tournament has seemed to skew towards younger players. In the NHL, Connor McDavid has led a revolution of young talent that was epitomized perhaps best when Team North America shocked several opponents in the 2016 World Cup. That team would score more goals than anyone but Canada in the preliminary round, and could have perhaps gone further if not for an early injury to Matt Murray. In Sweden this year, the league was dominated by Vancouver Canucks prospect Elias Pettersson and provided little challenge for potential first-overall pick Rasmus Dahlin. In a league that is notoriously difficult for young players, 19-year old Pettersson scored 56 points in just 44 games—leading the entire league. Other leagues experienced much of the same, like when Finnish forward Eeli Tolvanen tore through the KHL and broke several records for 18-year old scoring. Tolvanen also was one of several players who suited up for both the World Juniors and Olympics this season, and though that was partly because of the lack of NHL involvement, their success at such an early age can’t be overlooked. The same can be said for the upcoming World Championships, which will host a small but extremely interesting group of draft-eligible talent. Though Dahlin and potential second-overall pick Andrei Svechnikov will both miss the tournament, teams will be on the lookout for a few other names that could climb up their draft boards in the coming weeks. Filip Zadina didn’t make the Czech Republic team, but interestingly Martin Kaut did. The 18-year old forward was an impressive talent at the World Juniors earlier this year, and climbed all the way to fourth among International skaters in the final CSS draft rankings. It’s a huge honor for the young player, and another chance to impress scouts and push him further up the draft board. Joining Kaut from the international scouting list will be Martin Fehervary (Slovakia) and Yegor Sharangovich (Belarus), who were 15th and 51st on the final rankings. Fehervary is especially interesting as a defenseman who is not usually noted for his offensive ability. If he’s given a regular shift on the blue line against top competition, he could really improve his draft stock by just holding his own. Sharangovich may be more familiar, as he was at the tournament last year for Belarus and played all season in the KHL. The 19-year old wasn’t drafted in either of his first two years of eligibility, but is a big-bodied center that is just coming into his own. Most interestingly though may be Quinn Hughes, the superstar defenseman for the University of Michigan and potential top-5 pick in the upcoming draft. Hughes was named to Team USA and could finish an incredible year by making an impact in the international tournament. If given the chance—which is far from certain—the 18-year old high-flying Hughes could make a case to dethrone one of the top three forwards (Svechnikov, Zadina and Brady Tkachuk) and be the second defenseman off the board. His offensive potential is about as high as you can get, and he’s shown the ability to shut down rushes and move the puck quickly out of his own end. This group of young players likely won’t play prominent roles on their respective teams, but they are definitely names to watch if they make it onto the ice. Each is supremely talented and could make an impact at the NHL level down the road. Even though your team might be eliminated from the postseason, there are still plenty of reasons to tune in to some hockey this weekend. The tournament starts this Friday in Denmark.